Eighty-three percent of students and career professionals surveyed in a recent BusinessStudent.com Online MBA Report says program tuition cost was the number one consideration when choosing an online MBA program. 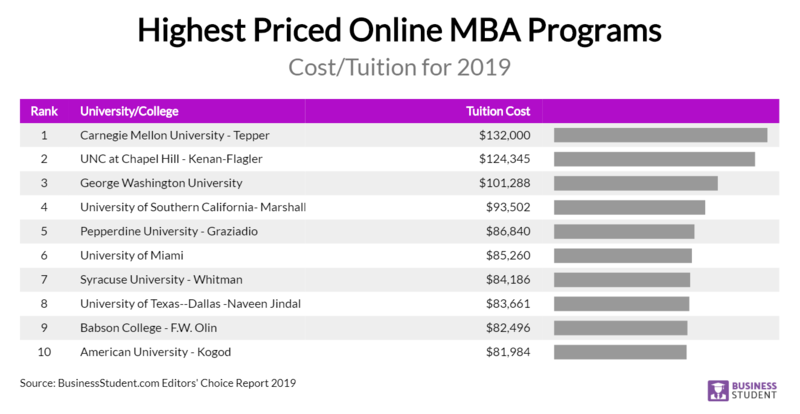 In order to help today’s prospective online MBA students, BusinessStudent.com analyzed more than 300 online programs from non-profit and for-profit universities around the country to compare the most affordable vs highest priced accredited online program options. The report attempts to show the extreme cost disparity between today’s Online MBA programs. The report also analyzed the per credit unit cost and the program tuition plus accreditation. Additional information in the full analysis included acceptance rate, student support, and engagement. Programs without accreditations (AACSB or ACBSP) were not included. The report found the Tepper School of Business MBA at Carnegie Mellon and the Kenan-Flagler Business School at North Carolina with the most expensive price tags of $132,000 and $124,345 and the University of Miami with the highest per credit unit cost of over $2,000. 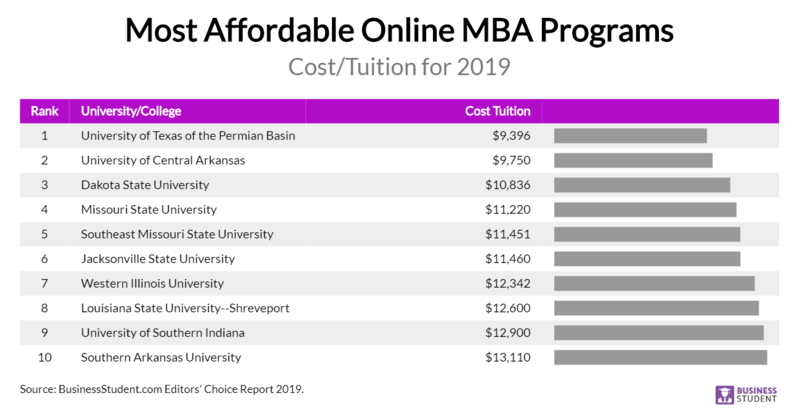 The University of Texas of the Permian Basin MBA and University of Central Arkansas MBA had the most affordable price tags with $9,396 and $9,750, respectively. The overall average cost of an online MBA program was $33,477. The following online MBA programs are ranked as the most expensive in the country. For a full list of highest priced MBA programs, click here. The following lists the most affordable online MBA programs available in the country. For a full list of most affordable MBA programs, click here. There is student debt crisis in the US that may not be necessary. Americans now owe more $1.48 trillion in student loan debt, among about 44 million borrowers. That’s about $620 billion more than the total U.S. credit card debt according to Studentloanhero.com. Further, approximately 40% of the $1 trillion student loan debt was used to finance graduate and professional degrees. For business students with an MBA, the average debt was $42,000, which was 11% of all graduate degrees obtained. The above data suggests that taking on so much debt to earn an MBA – even a highly rated program – may not be necessary. It could even be counterproductive if the starting salary of the business job does not keep up with your student loan costs. If, for instance, you attend Carnegie Mellon University, your tuition could soar above $132,000. You would need to score a high paying job in at least the $70,000 starting range to easily afford those loan payments. On the other hand, many of the most affordable MBA programs have tuition’s that are a fraction of the most expensive programs. Whether it is worth it or not is an open debate. Today’s business students have myriad options when choosing an accredited online MBA degree. These programs have less overhead and much of the same content as a campus experience so it can be more affordable. Depending on the career path, some may want to reconsider a high priced MBA degree and instead opt for an affordable, less competitive program. Also, a large percentage of people who participate in online programs usually have a wealth of experience, work full-time and balance the demands of their position with the MBA, so why incur more debt than needed? These students already display qualities that are important to employers, such as a strong work ethic, project management, and critical thinking skills. For these students, choosing an affordable online MBA program could be the perfect fit in obtaining the necessary business management skills. To be admitted into a quality online MBA program, whatever the price is, you will need to meet certain requirements. For example, most MBA programs require the applicant to have a bachelor’s degree in business, or in a closely related field. Some programs may accept any type of bachelor’s degree if it has a certain number of business courses in it. If not, you may need to take several prerequisite classes in business, accounting, economics, marketing or statistics to be considered for admission. Most programs require a certain GPA for admission. The more selective programs may demand a 3.5 GPA or higher, while less selective programs ask for a 3.0 or even lower. It also is common to require online MBA school applicants to submit GRE or GMAT scores. The score that you need to be considered varies by program. But some schools may not require scores; others may require them but offer a waiver option if you have a certain amount of professional work experience. MBA programs also may require some years of business experience. This requirement can vary from one to five years or even more, in the case of executive MBA programs. Check what the experience requirements are for the MBA programs you are considering before you apply. Also, be prepared to submit your undergraduate transcripts, and possibly writing samples to be considered for admission to most MBA programs. The most selective programs may also require a personal interview. The best policy about choosing an online MBA program is to carefully weigh what the program will really cost you (after all scholarship and grant funds are exhausted), how much your loan payments will be, and what your yearly starting salary is likely to be in your field and geographic location. By analyzing and crunching the data in this manner, you should be able to arrive at a logical decision about which online MBA program to attend from a cost-benefit standpoint. See also No GMAT Online MBA options for 2019. BusinessStudent.com is the fastest growing business education social community website dedicated to informing students and professionals on careers, courses, degrees, and jobs available in the competitive fields of business, technology and healthcare. Read our reviews on colleges and universities, and gain exclusive insight with interviews from top business school directors, deans, faculty and more. BusinessStudent.com’s articles are regularly featured on media outlets such as CNBC, Fortune, INC, Forbes, TheStreet, Entrepreneur.com, TheLadders.com and dozens of others.